From 3 to 5: competitive game. « Everyone for himself » just like in the base game. The goal is still to have two Metropolises at the end of a cycle. With 4 or 6 players: team-play (with teams of two) – The goal of each team is to have three metropolises at the end of a cycle. With 4 players, one can decide to play either competitive OR in teams. With 6 players, the team-play is MANDATORY. I love Cyclades, one of my all time favourite – the bidding mechanism makes all the difference. It makes you choose your steps wisely, makes you plot out your strategy.. “Ok so I need Poseidon first, to make the route, and then Hades to march my troops..”. This expansion kinda throws that out the window. EVERYONE can move, as long as they have Titans and enough gold. Don’t get me wrong, it’s very fun! just.. it’s no longer Cyclades, see? The bids become less important, and the fighting and dice rolls become more common. 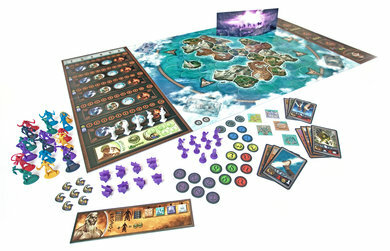 Add a Review for "Cyclades: Titans"